A group of insightful and opinionated bloggers began to share their thoughts about all these goings-on, under banners such as The Rise And Sprawl, Endless Spin, Policy Frog, Hacks and Wonks, Progressive Winnipeg, One Man Committee, State of the City, and Waverley West & Beyond. Most of these blogs have disappeared or gone dormant, but that does not mean the authors have. Most are still concerned citizens who are getting their message out in other places. David Watson’s Waverley West and Beyond blog abruptly disappeared from the ‘net in 2010, but the Past President of Save Our Seine is still involved in the community. He has also quietly rejoined the bloggosphere. A new group was recently formed to advocate for the preservation of woodlands and greenspace in southeast Winnipeg. This group, Riel Parks And Rivers Common (RPARC), is a collaboration between other existing groups, including Save Our Seine and also OURS Winnipeg, which made the news not long ago when it helped to kill the City’s golf course redevelopment plan. The structure and goals of RPARC is still a work in progress but you can get a sense of what they’re up to by following their blog: rparc.wordpress.com Some posts are just reprintings of letters or columns from elsewhere but others are new material, and although the posts are anonymous, much of what you see there is written by our old friend David Watson. 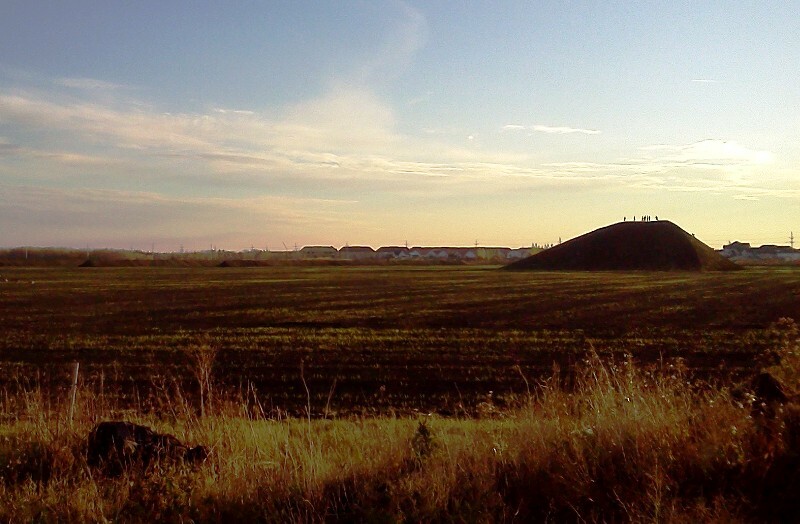 This morning I was surprised to discover mountains of topsoil towering in Fraipont, the former provincial landbank immediately south of Island Lakes in suburban St. Boniface. … The strip of farmland between the rump sections of Warde Avenue in Island Lakes and Royalwood has been cleared for future road construction … it looks like Precinct K may be closer to the development stage than first assumed. An informed source reports the following: “The stripping of black soil from the above lands commenced approximately. 2 to 3 weeks ago. According to reliable sources Genstar,an American based multi-national land developer, successfully purchased the Fraipont landbank from the Province this spring. I love the idea that a corporation is extracting the soil from farmland to eventually sell it back to the home owners on that same land for their yards and gardens. This is how great economies work. He goes on in later posts to note that Empire Co, the owners of Sobeys, holds a large stake in Genstar; although with a new Sobeys going up in nearby Sage Creek I think it’s unlikely we’ll see another one here. I find this “silent development” a bit odd. It is very possible that I just haven’t been paying attention. There may have been plans shared and reviews and consultations that I don’t know about. I don’t spend all of my time searching through announcements about subdivisions you know. But it seems to me that we hear about other developments like Ridgewood South in Charleswood, but southeast Winnipeg just seems to quietly grow, rapidly consuming the agricultural land within the Perimeter Highway in a random tangle of cul-de-sacs. Anyhow, I have been talking to much about urban sprawl lately and need to move on to other things. The point of this post is really just to say that it’s good to see Mr. Watson digging around and posting interesting tidbits on the internet again. Go check out it out.